Two diametrically opposed movies take center stage at the box office this weekend as an adult-oriented thriller is pitted against a kid-friendly musical/comedy. Will the usually solid Denzel Washington have enough momentum left over from his nearly two-year-old Oscar win, or will good word-of-mouth propel Jack Black and his youthful costars to victory? Easy money has Washington's Out of Time winning the race. With the exception of his more niche-filling, Academy Award bait films Antwone Fisher ($3.0 million debut) and The Hurricane ($3.2 million opening), Washington's opening weekends over the past few years have been as consistent as any performer in the business. Dating back to 1999's The Bone Collector, which had the lowest debut of the bunch at $16.7 million, Washington's impressive recent resume includes Remember the Titans ($20.9 million), Training Day ($22.6 million) and John Q ($23.6 million). Ads for Out of Time have been running rampant on network television, and they wisely play up the fact that Washington's performance has been receiving positive reviews (though the sources are a bit questionable). From clips, ads and trailers, the movie looks absolutely terrible, but audiences are very forgiving of that sort of misstep with this genre at this time of year (see: Double Jeopardy). Expect this one to fall on the low end of Washington's successes as it could pull in around $16 million. Jack Black isn't nearly as proven a performer, but he has shown in the past that he has a certain niche appeal. After officially breaking out in the fantastic but under-rated High Fidelity, casting directors began to look at him as a more bankable star, giving him a primary role in Saving Silverman ($7.4 million open). That movie was average at best and didn't set the world on fire in terms of financial success, but his first starring role was nothing short of special. The Farrelly Brothers' Shallow Hal required him to more or less carry the film on his more-than-able shoulders, particularly since he was given leading man status alongside talented co-star Gwyneth Paltrow. Despite controversy about its depiction of the overweight, the movie got off to a spectacular start with a $22.5 million debut, finishing its box office run with $70.8 million. Now, with School of Rock, he is again the star but the movie also solidly targets itself at families by being about private school kids with singular musical abilities. It's a clever blend of demographics, as kids will want to see School of Rock for the story just as young adults will for Black himself. The serious cinephiles will also be drawn to the film thanks to the presence of indie director Richard Linklater (Waking Life, Before Sunrise) and equally indie screenwriter Mike White (Chuck&Buck, The Good Girl) working behind the scenes on this more mainstream fare. Thus far, reviews have been outstanding, with Entertainment Weekly's Owen Gleiberman calling it the best movie to emerge from Toronto's film festival. Not only have early sneak preview showings last weekend generated plenty of goodwill, School of Rock is also 87% fresh (26 reviews out of 30) at RottenTomatoes. 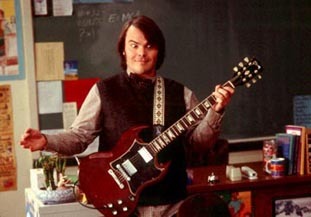 Look for School of Rock to ride a $13 million debut to a very strong long-term showing at the box office. As far as holdovers go, look for The Rundown to suffer substantial drops despite great word-of-mouth (mine included), Duplex to fall off the face of the Earth, and Under the Tuscan Sun to benefit from typical chick flick goodwill. Lost in Translation will expand to over 800 screens and decent numbers will solidify its chances at a potential Oscar run.